The 90’s were the decade of dinosaurs. Sure, the prehistoric creatures had already been capturing the imagination of the public for more than a century by that point, but in the 90’s a combination of scientific breakthroughs in the field paleontology and special effects innovations in the film industry completely changed the way we see dinosaurs. Literally! In the late 80’s Dr. Robert Bakker (who, by the way, happens to be our Curator of Paleontology) published his book Dinosaurs Heresies in which he postulated that dinosaurs were not the lethargic, cold blooded beasts portrayed in movies up to that point, but rather warn blooded, dynamic creatures. Jurassic Park would have been a very different movie if it wasn’t for the work of Bakker and other paleontologists who were changing the perception of dinosaurs. At the same time, new digital special effects meant that swift and speedy creatures could convincingly be portrayed on the screen. Dinosaurs had never been cooler.In the resulting dino craze, a lot of dinosaur movies were made in a variety of genres. Some were great, some were okay and some were just horrible. Now, in the modern age of reboots, a new chapter of one of the awesome movies, Jurassic Park, is coming out this weekend. But what about the others? This blog will list some 90’s dinosaurs movies with a great concept, but horrible execution, that I think could really use a reboot. Based on Sir Arthur Conan Doyle’s classic novel, this movie falls well short of it’s inspiration. It’s a remake of the original silent version of The Lost World released in 1925. Just to give you an idea of the missed potential here, let me tell you a little bit about the 1925 version. The movie was a landmark in special effects and as far as I know was the first live action dinosaur movie ever made. In that version, the plot basically follows a group of explorers who are seeking an isolated plateau in the jungles of Guiana which is supposedly home to prehistoric creatures that survived the extinction of the dinosaurs. They find the plateau, have adventures with the animal and human inhabitants therein, and eventually escape, taking with them a captured Brontosaurus that they intend to present to the Royal Geographic Society. After arriving in England, the creature ends up escaping and wreaking destruction throughout London. Sound familiar? It’s basically the same plot as King Kong and The Lost World: Jurassic Park and it looks like the New Jurassic World movie is going to be laid out along similar lines as well. So since the original movie has such a rich cultural legacy and has directly inspired so many hits, you might expect the ’92 made-for-tv remake to be pretty decent. However I would say that there are precisely two things that I found good about this movie: character actors John Rhys Davies (who played Gimli in Lord of the Rings and Sallah in the Indiana Jones movies) and David Warner (probably most famous for his role as Cal’s croney in Titanic, but who has been a part of many famous franchises). Davies plays Dr. Challenger, a hot-tempered genius who believes he has found a map that will lead him to the Lost World and Warner plays Dr. Summerlee, a skeptical scientist who publicly denounces Challenger as a publicity hungry fraud. Challenger persuades Summerlee to mount an expedition to prove that the Lost World is indeed a hoax, and Summerlee, believing this is his chance to finally disprove Challenger for good, agrees Through the course of the movie the two develop a wonderful bromance that for me was the highlight of the whole film. The famous character actors are really the only thing about the movie that feels natural, all of the other actors seem to just be reading aloud from a script, and a boring script at that. Dinosaurs make brief appearances, but are only revealed in a couple shots. 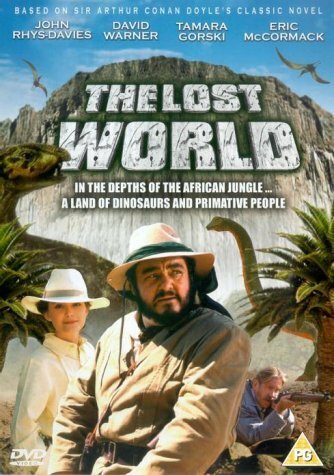 Admittedly the silent vesrion of The Lost World has a fairly watered down plot, which is understandable considering the limitations of telling a story without sound. Instead of the struggle to survive in a strange world (the focus of the plot in the novel) the 1925 film introduces a love interest for Ted Malone ( a newspaper reporter) and Lord Roxton (an adventurer) to compete over. I guess the language of love is easier to communicate without sound than fear is. Frustratingly, the ’92 version features a similar love triangle (this time it’s between Ted, a female native guide named Malu and a female adventurer named Jenny) with even less dinosaur action than the older version. Plus, the production quality of the ’92 version is worse in general than the ’25 version so any dino action you do see is disappointing. I honestly don’t understand why they even made this movie. I really want to see this classic story competently adapted to the big screen, or any screen for that matter. If this movie gets rebooted, I vote we keep Davies and Warner, but change everything else. From a disappointing remake to a totally original flop, this next film has a cool concept but poor execution. Thedore Rex is a buddy cop movie set in a future world where dinosaurs and humans coexist. 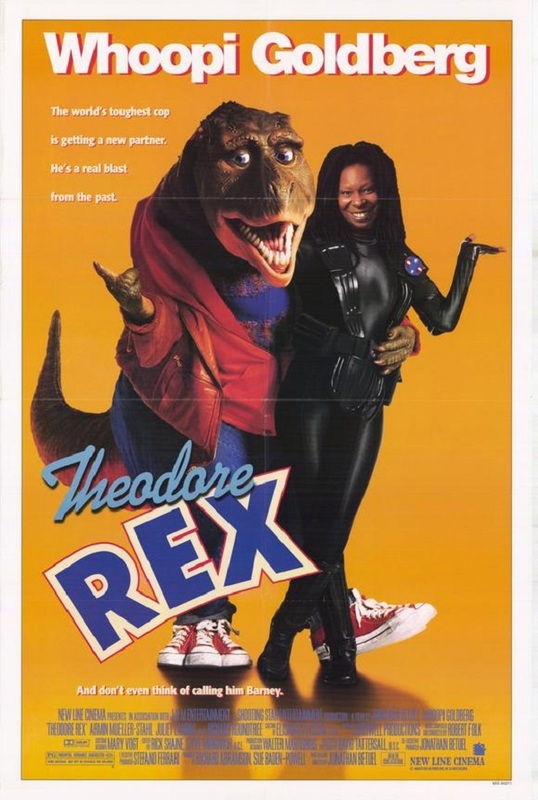 Whoopi Goldberg plays Katie Coltrane, a police detective who is paired with a T rex named Theodore (voiced by George Newbern) to stop an evil billionaire from triggering a new Ice Age. If this was a Disney/Pixar production, it would probably be the best thing ever. But as it is, it’s pretty horrible. I attempted to watch it, but I didn’t get very far before I had trouble focusing on the movie enough to keep up with what was going on. It’s just so boring! The entire movie is just a series of comedy skits revolving around placing a T rex in everyday situations, strung together with very little plot. It’s like a Saturday Night Live skit that just keeps going on and on for an hour and a half. Apparently I’m not the only one who thinks this. The movie was originally intended for theatrical release, but after performing poorly with test audiences, ended up going straight to vhs. At the time it was the most expensive straight to vhs film ever made, costing a whopping 33.5 million dollars. A portion of that budget went toward legal expenses when the producers sued Whoopi Goldberg for breaching her contract when she tried to back out of the deal shortly before production began. The case was ultimately settled in court and Goldberg was essentially forced to be in the movie or else pay millions of dollars in compensation to the producers. So, between a very angry star, a writer/director who kept changing the script and numerous technical problems, production became a nightmare. However, in the hands of a better production company a buddy cop movie featuring a T rex would be gold, so fingers crossed Disney/Pixar decides to resurrect it. 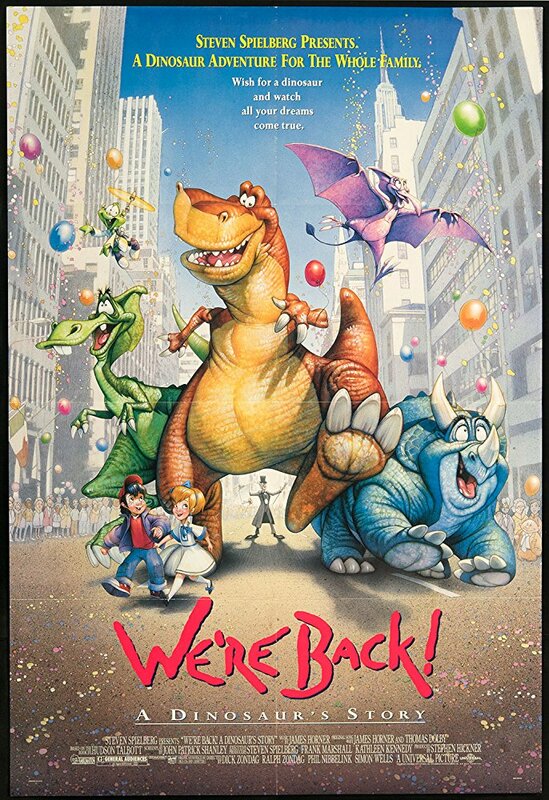 We’re Back is the forgotten step sibling to The Land Before Time. Stephen Spielberg executive produced both films, both films were scored by James Horner (a 90’s standby, he also scored Titanic and a number of Disney animated films) and both movies featured Dinosaurs. But while The Land Before Time remains in the hearts and memories of my generation, We’re Back has been largely forgotten. I seem to be one of the few to remember it, and that’s mainly because a scene where two kids are turned into monkeys positively disturbed me as a child. The concept is very original, and I had often thought about rewatching the movie to see how it holds up, but never did until the idea for this blog was sprung on me. Now, after watching it for the first time in probably 20 years, I can definitely see why it has been forgotten by everyone else. The movie features an all star cast, including the voices of John Goodman as a T rex, Walter Cronkite as a friendly scientist, Martin Short as a clown and Jay Leno as an alien. Here’s a basic summary of the plot: A T rex, a Triceratops, a Pterodactyl and a Parasaurolophus are abducted by a friendly scientist named Professor Neweyes and his alien sidekick, Vorb. They feed the dinosaurs “Brain Grain”, a breakfast cereal invented by Neweyes that makes whoever eats it more “evolved” and the dinosaurs transform into cuter, friendlier versions of themselves. Apparently Neweyes is from the distant future, where life forms from different planets must coexist peacefully. To help this happen, he invented Brain Grain, which apparently helps everyone become more evolved so that they are no longer inclined to violence. After becoming fabulously wealthy thanks to the popularity of Brain Grain, Neweyes invented a dream radio that allows him to hear the wishes of children from different time periods. His goal is to grant children the thing they most want, and apparently in the early 90’s every kid wants to meet a dinosaur. So they all time travel to the present (or I guess it’s the past now) and try to make their way to the American Museum of Natural History, but of course shenanigans ensue involving a boy who wants to join the circus and Neweyes’ evil brother, Screweyes. This all sounds super interesting, right? Well, it’s not. As awesome as the story sounds, the movie is actually pretty boring. The crazy concept is all there is to keep you interested. It sounds cool, but after the first twenty or thirty minutes, seeing dinosaurs walking around New York City gets old and there’s not much else to keep you interested. The characters aren’t developed very well, so the bratty little boy who the dinosaurs first meet when they parachute down to earth ( I know, so cool!) is just as bratty and annoying by the end of the movie. The dinosaurs like hot dogs. That’s pretty much all we learn about them, other than the fact that they don’t like to hurt children. But I would say that that describes most people in the world, so even though I can relate with the dinosaurs on these issues, I hardly empathize with them enough to watch their activities for an hour and a half. And that’s basically why this movie isn’t very good. It looks great, but once you invest time into getting to know it, you find out it isn’t a cool as you thought it would be, like most Tender dates. However, if a reboot ever hits theater, I’ll be the first in line to see it. Previous Post A Surprisingly Simple Recipe For Science-Minded Runners! Starbucks Didn’t Start The Pumpkin Craze, Mastodons Did!